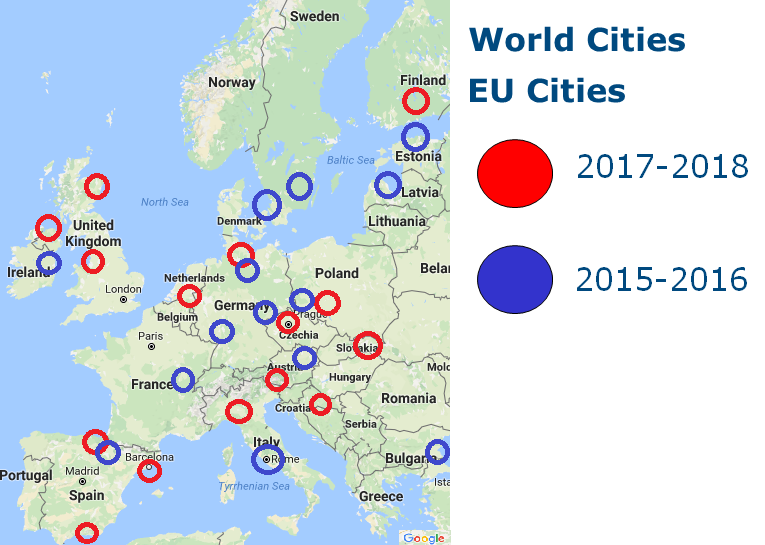 World Cities is a project of the European Union managed by the Directorate General for Regional and Urban Policy (DG REGIO) of the European Commission. The project was implemented from 2015 – 2018 and originated in a Preparatory Action of the European Parliament to promote the exchange of experience and best practice between the European Union and non-EU countries on the theme of territorial development with particular reference to urban development, urban-rural partnership and urban cross-border cooperation. The project facilitated the exchange of information and good practices on regional and urban development policy issues. Cooperation was based on the identification of pilot regions and cities and the development of concrete actions, for implementation in the short-term, in areas including urban innovation (smart-city) and green technologies (energy efficiency, low carbon development). Intervention areas were decided by the involved cities/regions, with strong support of the project team, and in coordination with the EU Commission (DG REGIO), the EU Delegations in the respective countries and national authorities of the non-EU countries where relevant. During 2015-2016, World Cities involved cooperation of EU pilot cities with pairs in India, China, Canada and Japan. 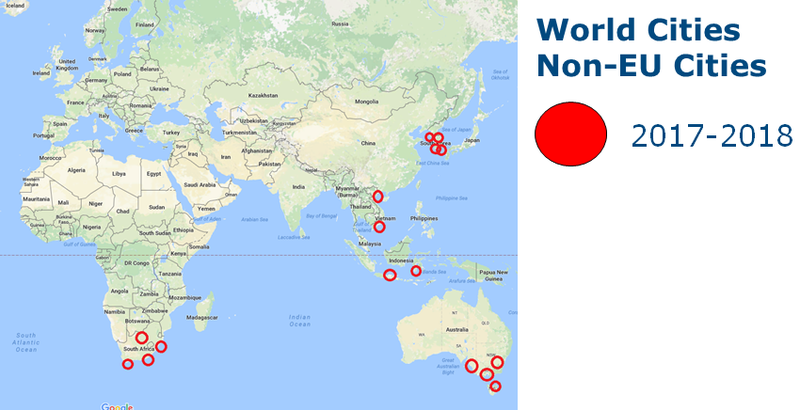 During 2017-2018, working meetings and pilot projects were developed between cities from the EU, Australia, the Republic of Korea, South Africa, Indonesia and Vietnam. The programme developed a collaborative online platform (forum) to facilitate the exchange of information and good practices between EU and non-EU cities. Project cities cooperate based on similarities between their thematic areas, experiences, and goals; communication with all cities in the exchange provides additional opportunities for collaboration and potential for new ideas. Actions were designed to increase so-called ‘triple-helix cooperation’ between governments, research and business. World Cities ultimate goal was to strengthen market opportunities and job creation while pursuing the sustainable economic development of the cities involved, thus fostering win-win cooperation.